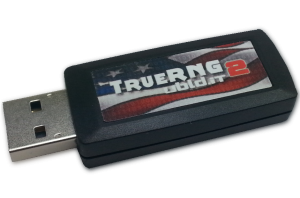 The TrueRNG USB Hardware Random Number Generator can be used for a variety of application where unpredictable random numbers are required. Game developers may want to use it to enhance game play. For example they could seed their Game Maps, Artificial Intelligence (AI) Algorithms, or randomize the level of difficulty of opponents. Data Scientist or Data Analytics might use TrueRNG for commercial process modeling simulations or to simply characterize the randomness of the random numbers themselves. Finally, Network Security (NetSec) and IT professionals use TrueRNG in Linux servers all over the world. In this case TrueRNG is used to keep the kernels entropy pool replenished to ensure fast and secure cryptography operations such as those that would be used for key generation, SSH, SSL, GPG and more. The point I’m getting at here is that TrueRNG can be used on multiple platforms for multiple purposes and applications. However, the hardware is very simple to understand. The communication interface is a simple USB serial port device. You can open up the port using just about any decent terminal application, turn on DTR (Data Transmit Read), and read out bytes. # for the viapadlock and tpm drivers. # HRNGDEVICE for that instead. Verify rng-tools service is running using top and cat your syslog for rng-tools debug info.